It’s that time of year again – time for spring cleaning. We’ve been doing a lot of it lately, and not just in our own home. We’re helping missionary friends get their home ready to be put on the rental market. It’s a big job and when we saw the condition of the house after the last tenants moved out, we despaired of getting it done quickly. But we were thrilled when several people showed up when we called a work bee. They came with rags and mops, rubber gloves and sponges, shovels and rakes, and they set about giving the place a good cleaning. There was a team assigned to the garage, one inside the house and one outside. Before long the whole area was a hive of activity. I was working with the crew inside so didn’t see what was happening outside until it was almost time to leave. I was stunned when I saw the transformation. When we arrived the yard had been matted with old leaves and grasses, a web of winter mould laying on top. The flower beds were quite ugly, with dead growth carpeting the soil, smothering anything that might have been trying to grow. 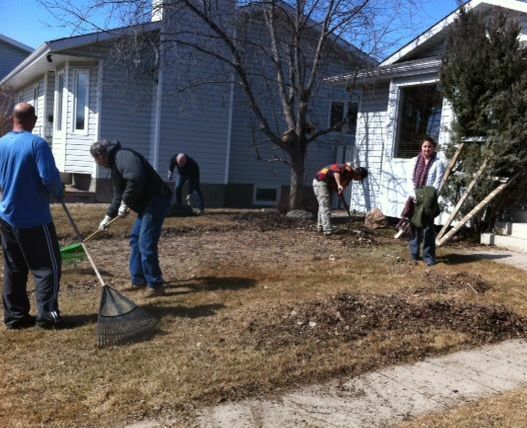 Several men had gone to work with rakes and shovels and the result was obvious. I was surprised to even see some green shoots coming up in the lawn. Then a friend pointed out the bright green shoots in the garden – crocuses, tulips and irises were pushing through. As I bent to examine them it made me think of the work God does in our lives. We sometimes must look as dreary and dead as that yard looked, layered with the leavings of old sin and smothered with the webs of guilt that threaten to smother us. But God is in the business of giving us all a good cleaning. How thankful we should be that Jesus has cleared all the rubbish away, just as surely as those rakes and shovels cleaned that yard. He did it by his death, the death we will celebrate in only a few short days. It seems odd to say those two words in the same sentence – death and celebrate. His is the only death I know of that is celebrated, by the people who say they love Him. We celebrate it because His death means our release, His suffering means our freedom and His mercy means we will have life everlasting. That’s why we call it Good Friday. And that’s why we celebrate not just his death but his resurrection. As Jesus said to his friend, Mary, “I am the resurrection and the life. The one who believes in me will live, even though they die; and whoever lives by believing in me will never die. Do you believe this?” (John 11:25,26). Mary said yes. Will you?